TELEGRAPH.CO.UK – Revealing the limitations of your business is an unusual move for any chief executive, particularly one who is hoping to take his company public in the near future. 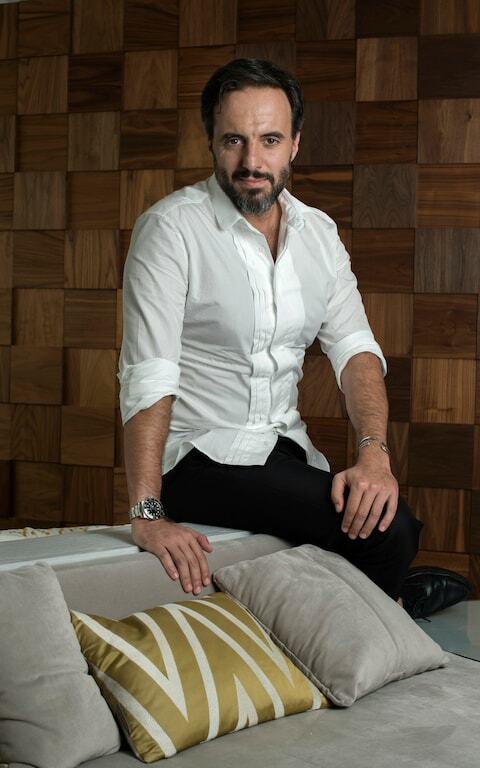 But José Neves, the boss and founder of luxury goods website Farfetch, is passionate about why the world of internet retailing can never fully recreate the “magic” of bricks-and-mortar shops. “Around 90pc of luxury goods are still sold in shops. It is changing but I think we will reach a maximum of 25pc to 35pc of luxury goods sold online. So, at the end of the day, around two thirds of sales will still be in physical shops”, the Portuguese entrepreneur says calmly smiling, crossing one bare, tanned ankle over another in Farfetch’s Shoreditch office. The entrepreneur is dressed for our interview in a Gucci pin-tuck shirt, available to buy on his site for £585, a pair of cropped black trousers by edgy designer Ann Demeulemeester (£438) and a pair of shoes by Swear, the footwear brand he launched almost two decades ago and of which he still remains a shareholder. “I get about one pair of them a month,” he says with a nonchalant wave of his hand. The office on London’s so-called Silicon Roundabout seems to have been designed by someone with a tick-the-box list of what a technology start-up now requires: concrete walls, open-plan offices, giant digital screens and dozens of hang-out areas where “creatives” have the freedom to be creative. The move was seen by some as Massenet putting two fingers up to Yoox Net-a-Porter, which she abruptly left before their merger went through. But her decision to join Farfetch also gave the business some serious clout. “I couldn’t believe she would join. It is a dream come true because she is one of the most inspiring people in business. But as we talked in the months after she left Yoox Net-a-Porter, we realised we shared the same vision,” Neves says, still giddy that one of the original pioneers of online luxury retail is now on his team. Swiftly after Massenet joined, Farfetch announced that it would be taking over Condé Nast’s Style.com online shopping venture after the Vogue and GQ publisher’s offering underwhelmed the market. The move has given Farfetch access to the type of glossy editorial content that attracts readers to the fashion bible. “How you can match editorial content and commerce is a formula that’s yet to be cracked,” Neves says diplomatically about Condé Nast’s fashion faux pas. “But they deserve respect for being bold and brave enough to try something, rather than just shrugging it off.” Details of how much Farfetch had to pay – if anything – were not disclosed, but Neves can’t have thought Style.com was too much of a flop, as he has since recruited a number of its staff including Yasmin Sewell, the architect behind it. Most recently, Farfetch has set its sights overseas since bagging a $397m (£308m) investment from JD.com, China’s second biggest online player. Even before the deal, Farfetch generated 10pc of its sales from China, but Neves said he realised this couldn’t continue without bringing in a local partner. While 270m Chinese users shop on JD.com, Farfetch will also immediately gain access to the mind-boggling 900m users of instant messaging and shopping service WeChat, which is owned by JD’s majority shareholder Tencent. “We’ve been busy,” Neves says with a wide, sparkling smile and a celebratory slurp of coconut water. Like Uber, which has become the world’s biggest car service but owns no cars, or the world’s largest accommodation provider, Airbnb, which owns no rooms, Farfetch owns no shops or even an inventory of the clothes, shoes and handbags it sells for hundreds of pounds. But unlike the online luxury fashion rivals it is often compared to – Net-a-Porter, Yoox and Matches Fashion – Farfetch is entirely dependent on old-fashioned bricks and mortar retailers for its stock. In addition to buying Mayfair boutique Browns Fashion in 2015, the business has a network of 700 hand-picked fashion boutiques spanning 40 countries, including Japan, Finland, Mexico and Dubai in UAE. Farfetch has appealed to the fashion crowd because shoppers can effectively search the globe for an item, such as a hat by on-trend designer Isabel Marant, that is sold out in their city or country and instead buy it from a boutique they’ve never heard of before, and have it delivered to them hassle-free as Farfetch takes care of duty, foreign exchange and different currencies. Neves acknowledges the difficulty in describing exactly how Farfetch works, firmly stating that it is “not a retailer but a platform” – a word that remains firmly on a list of jargon terms that tech entrepreneurs use. Farfetch has, at times, been described as a fashion version of takeaway business Just Eat. Neves smiles: “We are like an OpenTable plus Deliveroo,” he says, proud of his analogy. Theoretically, Farfetch’s technology, which tracks what the boutiques in its network are selling both online and in store, means that a shopper should never be confronted with a frustrating “sold out” message when clicking on their desired item. Neves is a self-confessed shopaholic, admitting that his travels abroad are often an excuse to check out a new boutique, such as a recent holiday in Tulum, Mexico, where he was introduced to luxury-boho brand Caravana, which has a stylised tent on a beach rather than brick walls. Neves’s enthusiasm for fashion was thrown off course at first, after studying economics at Porto University and branching out into the rather unfashionable world of computer programming. But he found himself mainly selling software to local shop owners and fashion manufacturers, whose lives sounded more appealing. It didn’t take long before Neves launched men’s shoe brand Swear, the only explanation for his move into shoes being that his grandfather owned a shoe factory and he was 22 – “I thought I could do anything”. Neves arrived in London in 1996 to open a Swear shop in Covent Garden, which he refers to as “our flagship”, despite admitting that it was the size of the “hole in the wall”. The shoewear brand sold to other shops. Shortly after the recession he realized that the only boutiques that were doing well were those that were already selling online. That was when he had the idea for Farfetch. “I was a shopkeeper, I saw how magical physical retailing can be when you have the interior decoration right, the products, the staff, the level of service, the music – it all creates an experience that cannot be repeated online,” Neves says grinning broadly. It seems part of him wouldn’t mind being back in his shop, counting the takings for the day. But Neves is aware of the rapid changes across the industry. So what’s next on the agenda? The company has been rumoured to be exploring a $5bn stock market listing in New York over the next 18 months, and the number of senior board hires over the past year certainly gives credence to that. “We have not decided where or when. The US is our largest market but it doesn’t really matter as we are a global business. Like many other business leaders, Neves is currently concerned about the messy negotiations surrounding the UK’s exit from the European Union. “I see no upside to Brexit from a business point of view. I won’t get into the politics. We won’t be, and haven’t been, too affected so far as we source and ship to 40 different countries. But I am concerned about what happens to our talent as we have 25 different nationalities, including myself, at Farfetch.